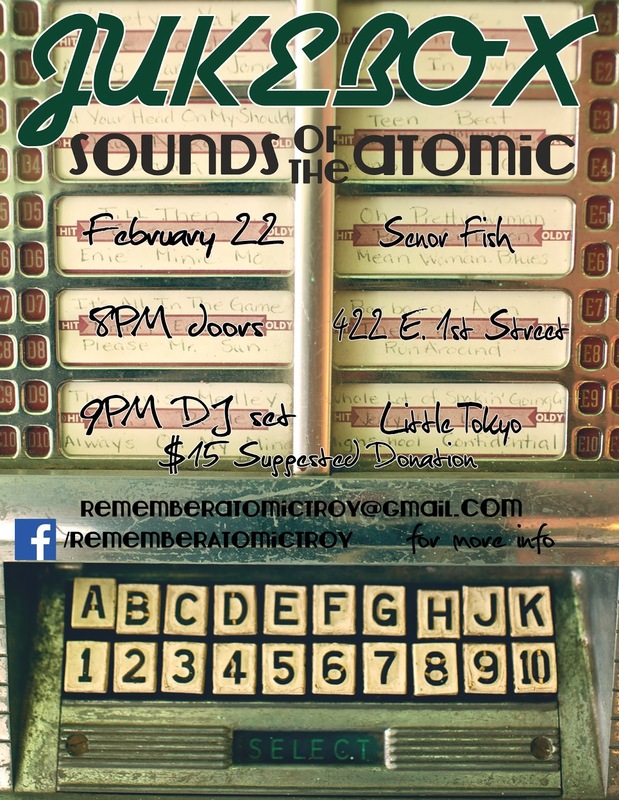 Do you remember the Atomic Cafe? Celebrate Feb. 22! 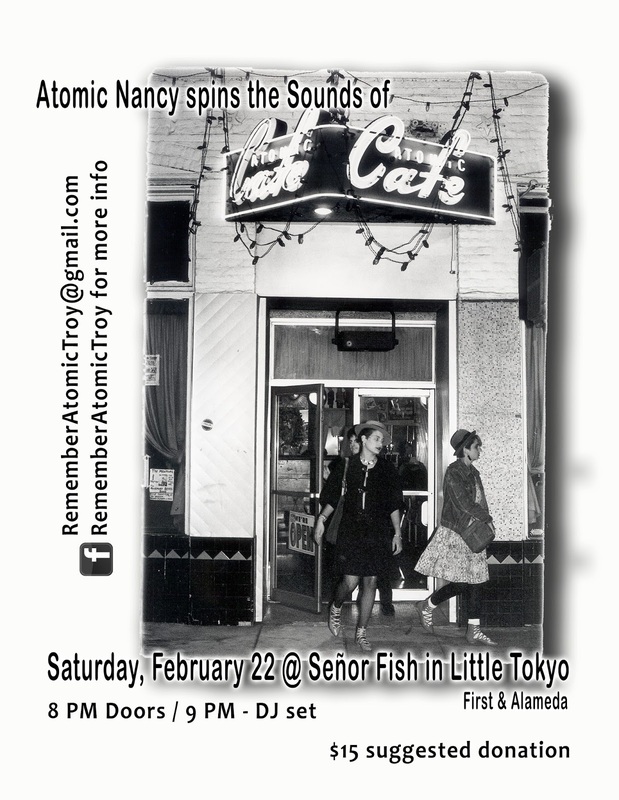 The Remember Atomic and Troy Cafés Community Committee invites you to Atomic Nancy Spins the Sounds of the Atomic Cafe, a celebration of the art, artists, sights and sounds of the Atomic Café and its successors, including the Troy Café, on First and Alameda Streets in Little Tokyo. This uniquely L.A. arts space will soon be demolished to make way for a new Metro station, so join us as we reminisce, reconnect and remember the Atomic & Troy Cafés while the one and only Atomic Nancy spins original 45s from the café's infamous jukebox. $15 suggested donation ~ ALL AGES. Advance donations can be made via PayPal at the Little Tokyo Service Center's website. 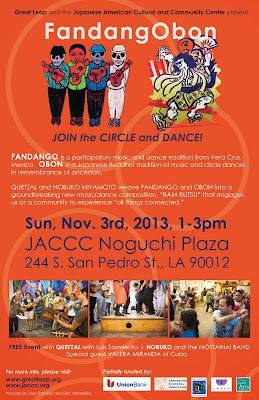 Join Great Leap's Artistic Director Nobuko Miyamoto from Great Leap and Grammy-award winning QUETZAL this Sunday, November 3rd from 1pm to 3pm in the new cross cultural collaboration, FandangObon! According to Nobuko, "It all started when Quetzal invited me to a Fandango class he and Martha Gonzalez were teaching. I was so impressed with the beautiful way in which everyone participated, either by playing a jarana (small ukulele-like instrument), by stomping out drum like rhythms or by singing. It reminded me of what Taiko and Obon are to the Japanese American community. Everyone takes part. In a time where we are mostly observers of entertainment or see life through our computer or cell phone screens, those gatherings are rare opportunities." "So, for the past several weeks the Mottainai Band and I have been zigzagging across the First Street Bridge to meet up with Quetzal Flores and Martha Gonzalez of QUETZAL. Together, we have held workshops in various locations with the folks from Senshin, Higashi, Nishi Buddhist Temples, Self Help Graphics, Eastside Cafe, and we've even gone to Orange County to teach this new dance. I'm seeing the magic of music and dance unfolding in our new collaboration, BAM BUTSU--'all things connected.' We've been sharing stories, learning about each other's traditions and finding the joy of dancing together.​"
Joining Nobuko and Quetzal in this fun, participatory day celebrating community-based arts joining the Mexican American and Japanese American communities, will be musicians from the Mottainai Band which includes the fantastic Danny Yamamoto, George Abe, Sean Miura, with Mottainai singers, Atomic Nancy Sekizawa, Carla Vega, Martha Gonzalez, and the Mottainai Kids. Special guests include Luis Sarmiento, and Valera Miranda from Cuba. Did I mention that this event is FREE! Yes! Ok who's joining us? Share this on Facebook, Twitter, Instagram, or where ever you hang out. 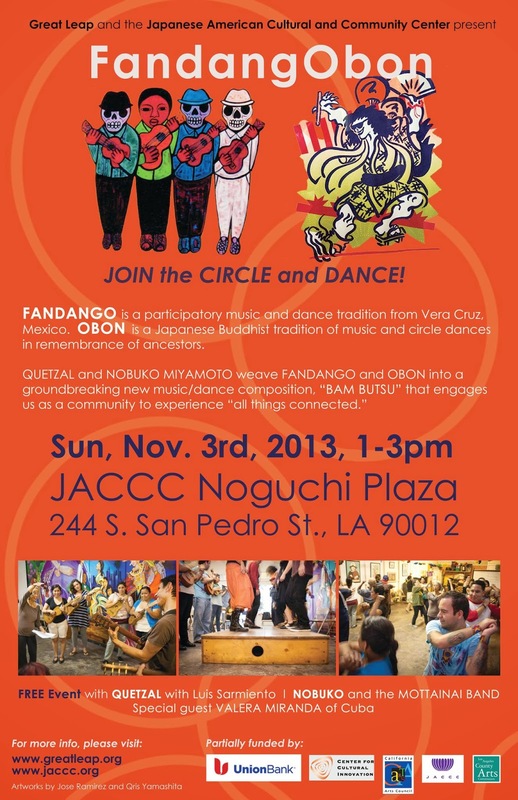 It will take place at the JACCC Noguchi Plaza, 244 S. San Pedro Street, Los Angeles, 90012. Park at Aiso Parking Garage at 1st & San Pedro, Little Joe's on 2nd Street between San Pedro & Central, or you can find free street parking on Sundays. Here are two suggestions if you have 2-3 hours in Little Tokyo tomorrow afternoon (Sat. 10/19/13) and you are looking for something to do. 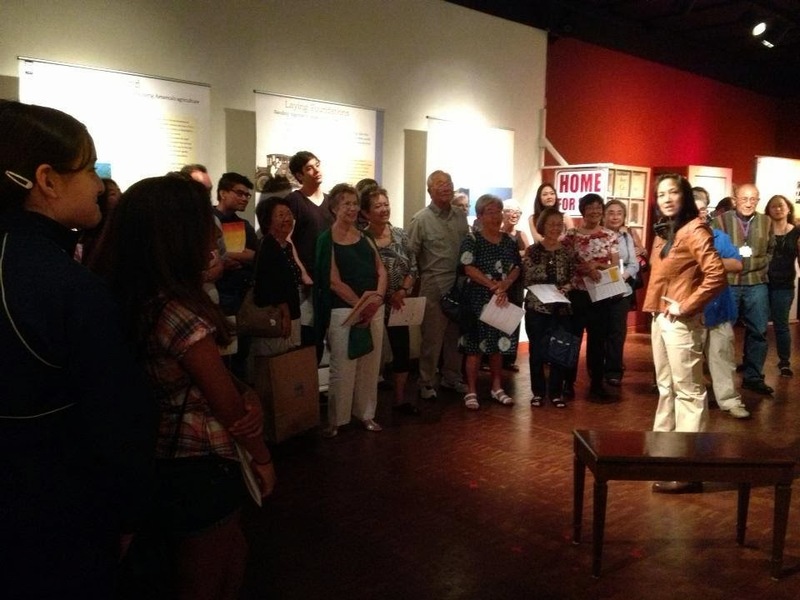 Both events are at the Japanese American National Museum. A two-person show featuring Traci Kato-Kiriyama and Johnny Kwon exploring six diverse stories of Asian Pacific Americans. Presented in partnership with East West Players in conjunction with the "I Want the Wide American Earth: An Asian Pacific American Story" exhibition on view at the Japanese American National Museum through October 27, 2013. By D’Lo, Vivian Keh-Hue, Giovanni Ortega, Jeanne Sakata and Ova Saopeng, Judy Soo Hoo. Directed by Jennifer Chang. In conjunction with the exhibition I Want the Wide American Earth: An Asian Pacific American Story. I saw this piece a few weeks ago, and it was amazing. I love traveling performances (where the audience and the artists move through a performance space/exhibit area. Our Saturdays are filled with my kid's basketball and soccer schedule, but we managed to make it to a show in between a game and a practice. Traci is fantastic... my favorite piece was the piece that is seen in the photo below about the first Asian American female aviator. If you go, leave a comment here, and let me know which is your favorite piece. Lela Lee, author and artist of the comic book series, Angry Little Girls, will discuss her comics and their impact on Asian Americans and beyond. In conjunction with the exhibition Marvels & Monsters: Unmasking Asian Images in U.S. Comics, 1942-1986. I love Angry Little Asian Girls. I wish I could go see her speak. I love the message of empowerment from these fierce young women. If you go, let me how it went. Take the Gold Line, or park at 1st and Judge John Aiso Street at the Aiso Parking Garage and walk down historic First Street. Stop at Daikokuya, or Mr. Ramen if there's too long a line, pick up some manju from Fugetsudo on First Street. Japanese American National Museum, 369 E. First Street, corner of 1st and Central Avenue. 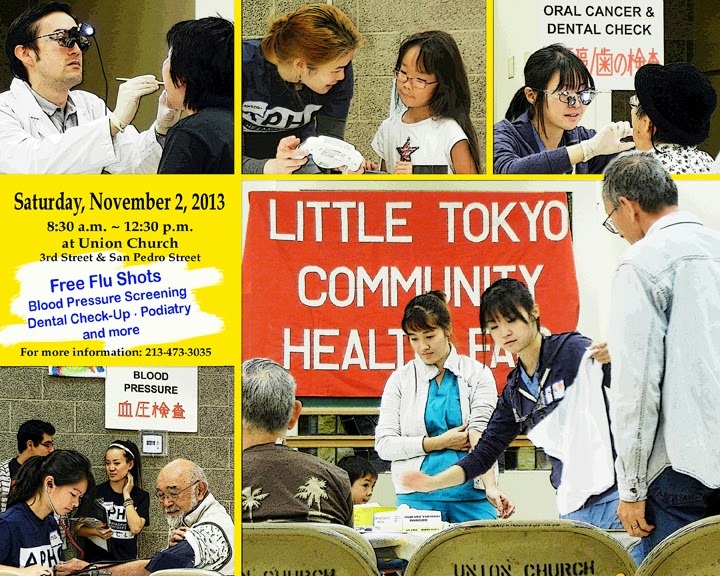 The LITTLE TOKYO COMMUNITY HEALTH FAIR will take place on Saturday, November 2, 2013 from 8:30am to 12:30pm at Union Church on Third St & San Pedro St. 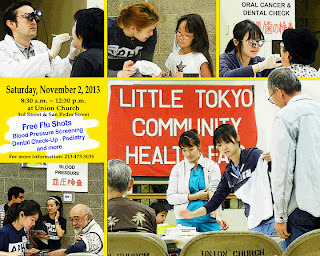 The Health Fair is free and open to everyone in Little Tokyo, young and old. They will offer free flu shots as well as blood pressure, BMI, dental, feet and eye check up. For more information call (213) 473-3035.